A Middle East Without Christians? A USA/Europe Without Muslims? In 2013 a newly elected Pope Francis, responding to the rising concern about Christian refugees leaving the Middle East in the wake of persecution, made this comment, “The Vatican will not resign itself to a Middle East without Christians.” Since that time those leaving from areas like Northern Iraq and Syria has only been on the increase. Last year I was near an area of Northern Iraq that only a few months later came under the control of ISIS, causing even more Christians to flee for their lives. 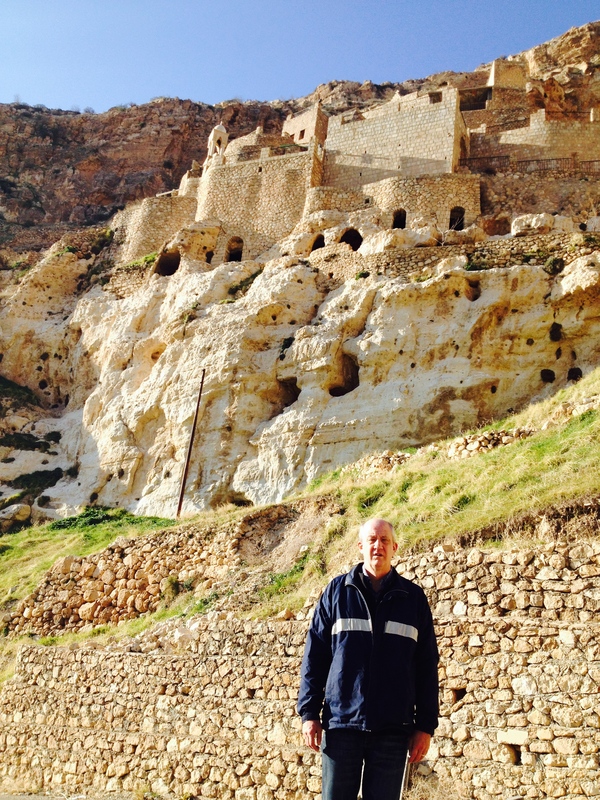 The photo here shows me in front of a Christian monastery that for over a thousand years was a place of life and witness. It has more recently housed refugees. For many reading this post the concern about these Christians is very strong, as is the desire to see the departures stopped. It is not only Pope Francis that finds a Middle East without Christians unacceptable. As I will write about in a couple of days in another post, Christians have lived in the Middle East since the first century, a vibrant and influential community. It is also not only Christians in other parts of the world that desire to see this stopped and reversed. There are also many Muslims in the Middle East itself that find what is happening abhorrent and desire to work for change. To think of a Middle East without Christians, or Jews for that matter, is unacceptable and must be resisted and reversed. But also disturbing this last week was to read of a prominent American Evangelical leader who called reportedly for a limit or stopping of Muslims coming into the United States. Others have questioned the loyalties or patriotism of the almost 4 million Muslims already in the country. What this creates at times is a paranoia related to Muslim communities in the USA and Europe. Perhaps even a desire on the part of many to see Muslims leaving, though this may not be stated openly. Can we who are Christians also say that we find a USA and Europe without Muslims to be unacceptable as well? We need Muslims in our communities in the West in the same way the Middle East needs Christians and Jews. Here are a few reasons. First, there is a richness of culture and life that different faiths bring to a community and nation. We are impoverished when we draw back within our own walls and communities. We miss the diversity of presence and encounter that comes from mixing with others. That is as true in Cairo and Jerusalem as it is in Seattle or London. Secondly there is an important ministry of hospitality and witness that needs to be extended to others, and we are so much weaker without it. In all three faith traditions of Judaism, Christianity and Islam there is a strong commitment to hospitality evidenced both in their scriptures and practice. This hospitality includes the stranger and refugee as well as the friend and brother. The giving of hospitality is vitally important in our communities today, whether in Baghdad or Berlin. Having those of other faiths for meals or common community events is crucial to build relationships that will endure the propaganda of fear and exclusion. Thirdly our common humanity demands that we extend love and mercy to each other, including the commitment to live among those that are different than us. This is easier at times than others and in some places and not others in our world. But it starts with declaring unacceptable the idea that whole parts of the world will be free of a certain faith or community. Meanwhile Voice Of the Martyrs is asking us to join in prayer with Syrian Christians for God to raise of leaders to help disciple a rising itide of new Muslim converts. History has shown that the more the church is persecuted, the faster it grows. Thanks for your post. It is distressing to imagine centuries-old communities of Christians (and other minorities) who are fleeing their Middle Eastern homes. We can understand their strong human desire toward self preservation, yet nevertheless, we grieve for a presence and witness that is lost. As you mentioned, there are many Muslims who equally mourn the loss of vibrant, multi-religious, multi-ethnic communities. Regarding religious diversity in Western countries: I would add that the global shifting of peoples, particularly to the West, is a God orchestrated opportunity for the Western church to engage with otherwise inaccessible people. When Christians are reluctant to go to countries that are traditionally closed to the Gospel, God, in His indiscriminate love for all nations, brings needy people to us. What I find truly abhorrent, is the recent trend amongst Western Christians to close ranks and resort to their own brand of self-preservation. In doing so, they reject the very opportunity for witness that God brings to their doorstep. Are we really so content to sacrifice the eternal destiny of our Muslim brothers and sisters on the altar of our own safety? I’m sure this saddens and perhaps angers the heart of God. Yes, in the middle of darkness there are bright lights of hope. Especially represented by courageous leaders that are all over the Middle East. Thankful for groups like Voice of the Martyrs that are committed to making their voices heard. Next Post Dear Mr. Graham, Let me Introduce you to Some Friends….